Patching systems and applications is a huge challenge, and doing it manually is not an option. 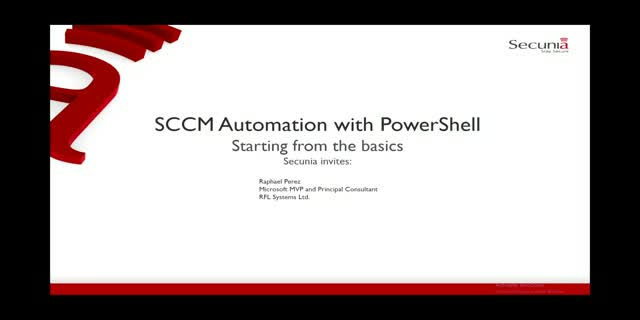 In this session Microsoft MVP Raphael Perez will look at the basics of SCCM Automation with PowerShell. You'll learn when automation should be used, get tips on making the most of WMI, SCCM PowerShell cmdlets and some of the techniques he uses when creating automation scripts. About Raphael Perez: Raphael is one of the only three ‘Enterprise Client Management MVPs‘ based in UK, specialising in System Center Configuration Manager (SCCM) and with over a decade of front-line enterprise experience of working with Microsoft technology and Management solutions. Raphael has worked on a number of different enterprise SCCM, OS Deployment and Patch Management projects over the years. Raphael Perez, Microsoft MVP and Principal Consultant, RFL Systems Ltd. Presented by: Raphael Perez, Microsoft MVP and Principal Consultant, RFL Systems Ltd.